This rich Indian sauce is packed with enough spices and layers of flavour, you will want extra rice or naan bread to mop up every bit of sauce left on your plate. Key to making a dish like this is to have all your ingredients ready at hand. Here I’ve blended all the dry spice together so it is ready to be stirred in at the moment I need it. Chefs call this “mis en place”, which simply means having everything ready to go, BEFORE you start cooking at all. It sure does make things smoother! Place the onions, garlic, and 1 cup of water in the bowl of a blender. Puree until smooth. Measure out the spices (curry powder through nutmeg) into a small bowl. In a large saucepan heat 3 tablespoons of olive oil over medium heat. Once the oil is shimmering, add the pureed onion mixture and cook for a 2-3 minutes, stirring constantly, until it begins to darken in color. 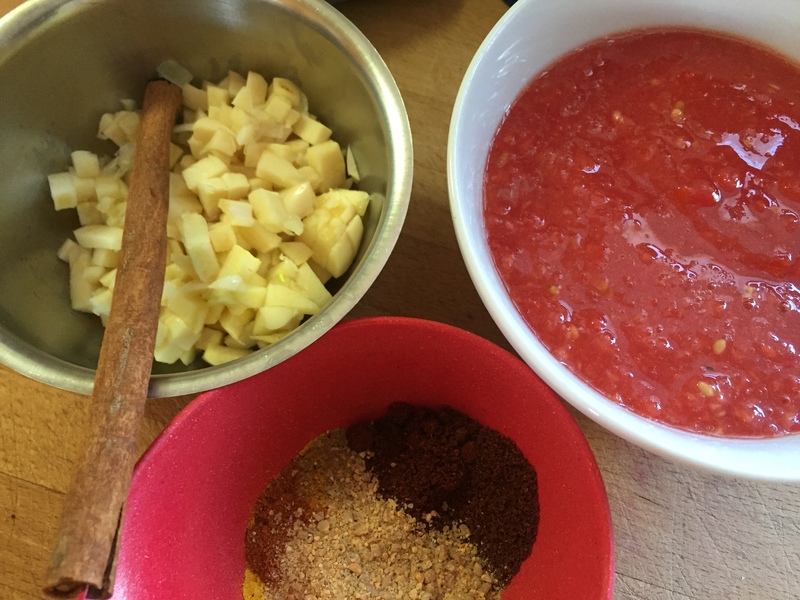 Add the tomatoes, ginger, ground almonds, coconut milk, yogurt, red chili, pre-measured spices, and brown sugar. Stir well. Turn the heat down to low and simmer 30 minutes. Cut the chicken into bite-sized pieces and add to the pan; simmer for an additional 15 minutes. I had roasted a whole chicken the day before and felt like this Korma would be the perfect way to eat it all up the next day. Use a rotisserie chicken for a quick dinner if you don’t have leftover chicken on hand. Honestly, when we eat out, we usually order lamb korma, so you could just as easily use any protein of your choice – or go vegetarian and stir a bunch of fresh vegetables in. Served today with homemade naan and the best crispiest crunchiest vegetable pakora! Be prepared for the whole house to smell amazing for a couple of days after you prepare this specialty. I particularly love it in the fall or winter when it also seems to help warm the house…. Don’t be alarmed by what may look like a lengthy list of ingredients, most are items in the pantry anyway, and if not – try out something new and find more ways to use it. 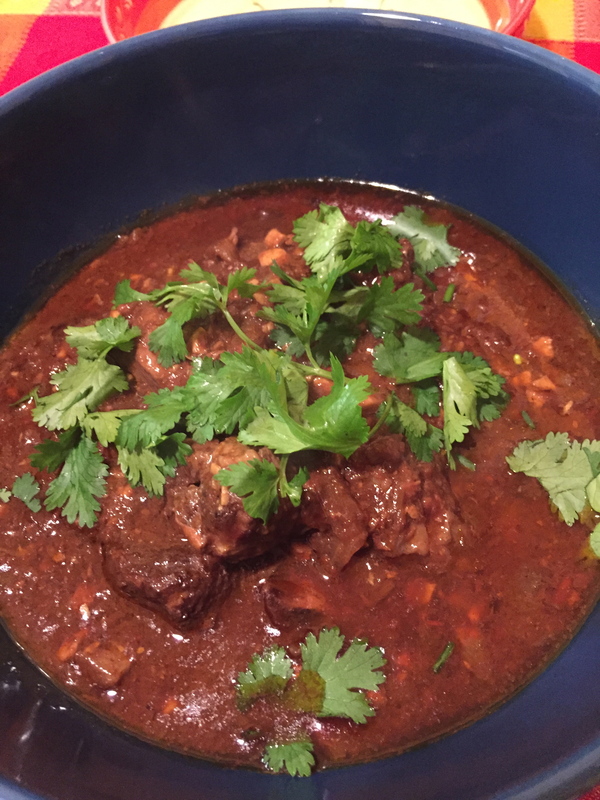 Topped with fresh, fragrant cilantro this rich curry will make you feel like a super star. Use a large pot for this, with a heavy bottom. Take your time with the onions – part of the rich flavour in this dish is from allowing the onions to get nice and browned, slowly. Once they are a rich gold colour add the garlic and sauté until the garlic is a golden brown also. 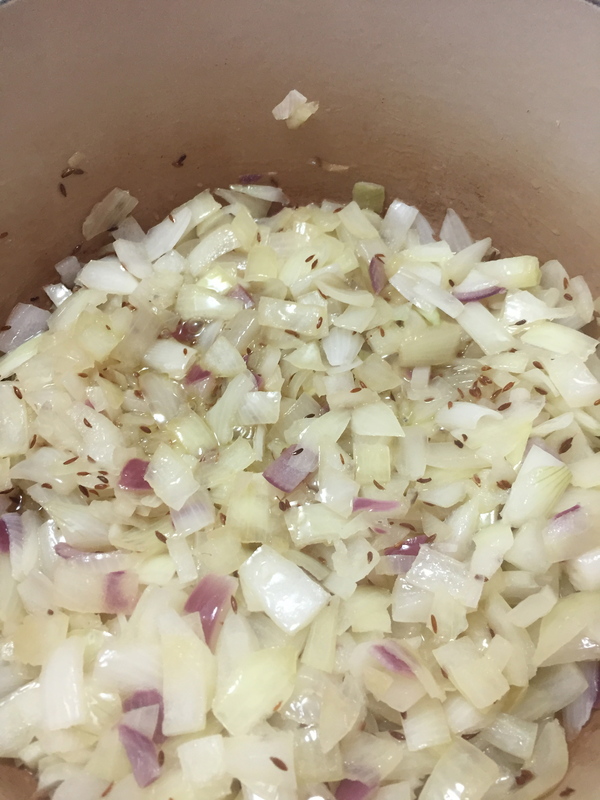 The longer the onions spend slowly getting dark the more rich flavour the curry will have. Take your time and allow these onions to deepen in colour and caramelize enough to bring out their sweetness. Reduce the heat to low and add tomatoes, fenugreek, cumin, turmeric, cayenne, chili and cinnamon bark. Stir well and slowly increase heat to medium. Allow to cook until the ghee starts to separate from the tomato mixture (you will notice pockets of clear liquid on top). While your onions are happily cooking, organize the rest of the ingredients so that you are ready to add them all at once – makes everything so much easier. Stir in red wine and chicken stock – bring to a boil. Allow to cook, stirring enough so that it doesn’t stick, until once again the ghee separates from the mixture. Add short ribs, stir, cover and allow to simmer for about 4 hours. NOTE – the cinnamon is meant to be subtle in this recipe … just a hint of it. While it is cooking, if you notice a strong cinnamon scent, remove it from curry, it has done the job. Professional chefs and equipment probably get this ready for the simmer in 20-30 minutes, but it always takes me an hour to develop that colour in the onions and complete the prep stage. Sprinkle with fresh cilantro and serve with basmati rice. A perfect dish to accompany this? 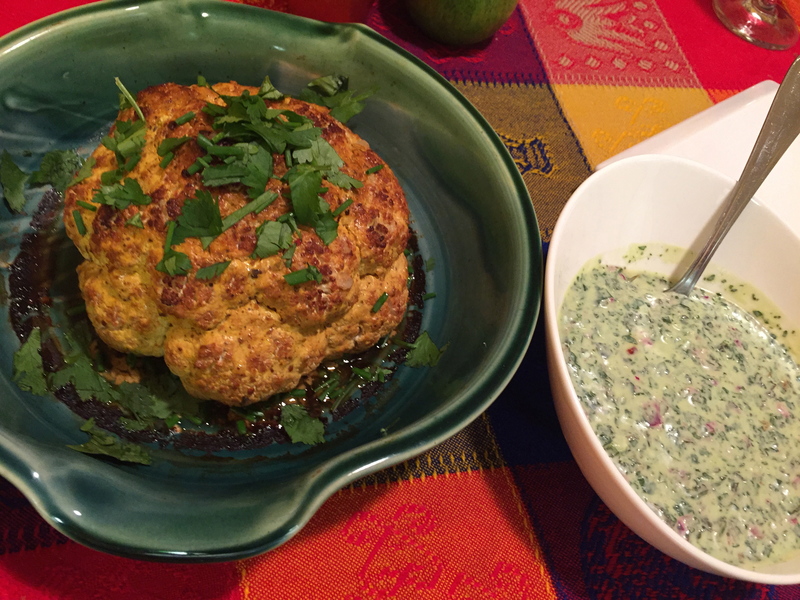 My roasted tandoori cauliflower with mint & cilantro sauce. For an impressive presentation, roast the cauliflower whole with the cilantro & mint sauce to serve. If you want the cauliflower to roast quicker, and really just want to get it on the table, simply cut cauliflower into florets and roast. Florets may take about 20-30 minutes to roast depending on the size. Only cook them long enough to be fork tender. This curry is beyond delicious. If you want to make it a vegetarian dish it is easy enough to do – use all vegetable oil to sauté the onions and replace chicken stock with vegetable stock. When it comes time to nestle the short ribs into the stock just substitute ribs with any of your favourite vegetables. If you are using root vegetables that take a long time to cook go ahead and put them into the curry early. If using vegetables that take less time, put them in the curry closer to the end of the cooking time.